Having amassed 98 points in winning the Football League Championship in 2002-03, Portsmouth were back in the top flight for the first time since 1987-88, which in turn was the only campaign since 1958-59 that they had been at such a high level. 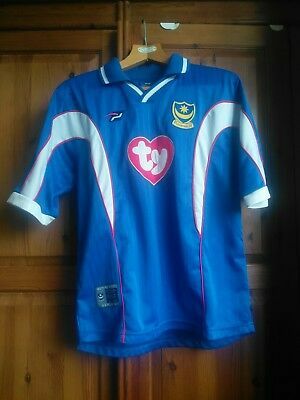 At the time, the club produced their own kits under the Pompey Sport brand and, to celebrate reaching the Premiership, they came up with a strip which was reminiscent of the Nike offerings at the 2002 World Cup. It was a strange state of affairs to have a second shirt which didn’t really solve many clashes caused by the home kit, but this was almost a literal ‘away kit’, intended to worn in as many games as possible on the road, even when there was no clash. Exceptions were at rivals Southampton, Newcastle United and Fulham and Tottenham Hotspur, while the previous white away shirt was retained for games against other teams in royal blue (with the navy away socks worn at Chelsea). 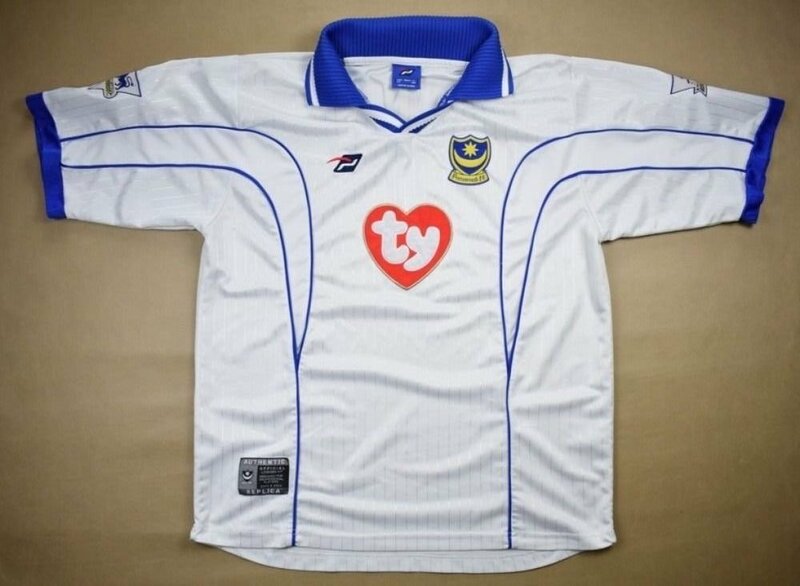 Portsmouth brought out a new white change kit for 2005-06, with the navy kept as a third and it was worn with the white shorts and socks at Blackburn. We’d be interested to hear readers’ thoughts on the Portsmouth situation from this season. While other teams like Arsenal or Leeds had been wearing alternative kits against sides with whom their shirts didn’t clash since the 1970s, this practice emanated from the introduction of the shorts-clash rule and those clubs not wanting to wear alternative home shorts. Portsmouth’s decision was certainly made from a marketing point of view, given that the shirt provided little differentiation from the first choice. Was it start of an epidemic from which there won’t be any return, or was it more acceptable than today’s needless use of change kits because the colours weren’t a million miles from the home strip? Comment below or on Twitter @museumofjerseys. Real Betis must have set a record for this kind of thing this season. Their home, away and third kits are all mostly (differing shades of) green!